Valentine's Day means couples on steroids. We understand. You can’t bear anymore chat from your loved-up friends about where they’re being whisked away to by their one and only. Boasting about day trips, candle-lit dinners, and massive stuffed animals (where does one even find those? )...we can’t handle it either. But, don’t panic! Instead, round up your best pals and get excited about a night out in London town, free from roses, chocolate (okay maybe a little chocolate), and unnecessary PDA. Anyone up for speed hating? It’s much like its counterpart, speed dating, but instead, you meet your match by bonding over the things you loathe. People who stand to the left of the escalator? That really irritating Go Compare advert? Tourists on Oxford Street? The world is your tirade-filled oyster. When: Wednesday, 13 February 7 to 10 p.m. So, if your couple-y friends aren’t actually making you sick, just bring ‘em along to Be At One’s Traffic Light Party. The premise is simple. Wear green if you’re single, red if you’re taken, and amber if “it’s complicated.” If the idea of wearing all green doesn’t appeal, don’t fret! You’ll be given chic wristbands in the colour of your choice. The bonus? All-night happy hour. Looking for a Valentine’s Day filled with drama, intrigue, and a little bit of luxury? 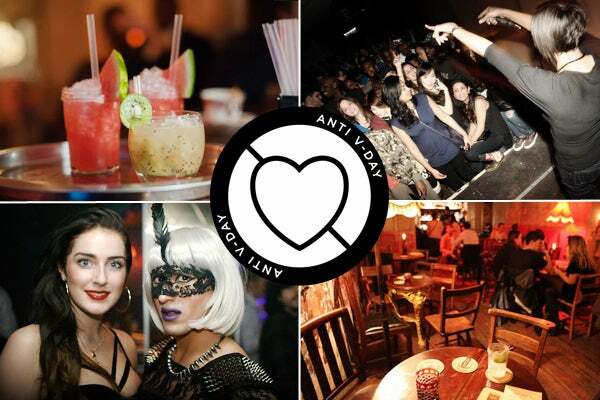 Get your masks on for Proud Camden’s Valentine’s Day masquerade ball. The popular stables-turned-club is the perfect place to get dressed up and potentially swept off you feet by someone swoon-worthy, (Our ideal would be the Dread Pirate Roberts a.k.a Westley from The Princess Bride.) Stay late for the cabaret and burlesque show, and by all means, do as the masked do and get up to no good! When: Saturday, February 16, 7 p.m. to 2 a.m.
Love beer and Biggie? Check out the Social’s Hip Hop karaoke night. This hidden gem behind Oxford Street has a song list as long as your arm with current faves and hip hop classics, so get ready to grab the mic and belt our your version of "Drop It Like It’s Hot." Note: All performers win a beer for their efforts! When: Thursday, 14 January 7 p.m. to 1 a.m.